Oh, I realize it’s a penny here and a penny there, but look at me: I’ve worked myself up from nothing to a state of extreme poverty. 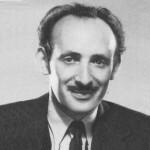 Arthur Sheekman was a American critic. Arthur Sheekman a graduate from the University of Minnesota, started his career as columnist and drama critic during the 1920s and the early 1930s for the Manhattan Newspaper. He then entered the film industry in 1931 when he became a scenarist for the Marx Brothers' movie Monkey Business where he befriended Groucho Marx. From then on it was known throughout the film production business during that time that Groucho detested the other writers and favored Sheekman over them.